Feel like someone is snooping on you? Browse anonymously anywhere you go with the Onion Pi Tor proxy. Using this pack of parts and a free weekend you can build a project that uses a Raspberry Pi, a USB WiFi module and Ethernet cable to create a small, low-power and portable privacy Pi. After it's built, using it is easy-as-pie. First, plug the Ethernet cable into any Internet provider in your home, work, hotel or conference/event. Next, power up the Pi with the 5V 2A Power Supply. 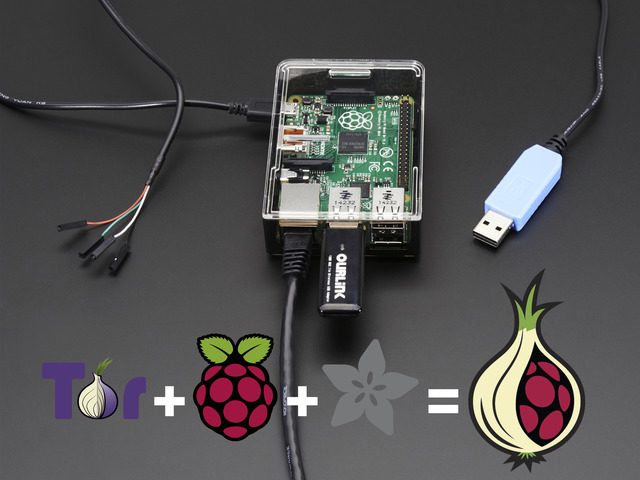 The Pi will boot up and create a new secure wireless access point called Onion Pi. Connecting to that access point will automatically route any web browsing from your computer through the anonymizing Tor network. Raspberry Pi Model B+ 512MB RAM - The freshness. The hot off the press, sell-like-hotcake, credit card sized computer with quad USB ports, improved power supply, and additional GPIO pins. Adafruit Raspberry Pi B+ Case - Smoke Base / Clear Top - We think it's the Single Greatest Raspberry Pi Model B+ Case Ever - though our Pi Box Plus is also nothing to scoff at. USB WiFi Module - Give your Rasp Pi the Internet with this USB port WiFi module, this module is compact but has great range and is plenty fast. 5V 2.5A Switching Power Supply w/ 6' MicroUSB Cable - The 5V 2.5A power adapter is the perfect choice for powering your Raspberry Pi B+ with 2 Amps of current output, and an extra long cord. 8GB SD Card with full PIXEL desktop NOOBS. - an 8GB card with NOOBS already installed so you can get right to it. You'll still need to set up the access point and Tor software according to our tutorial. This project is best used by people with a little bit of command-line, linux or Raspberry Pi experience. If you've set up a Raspberry Pi and configured it before, this project will be a fun experience. We have tons of tutorials for exploring Raspberry Pi in the Adafruit Learning System.